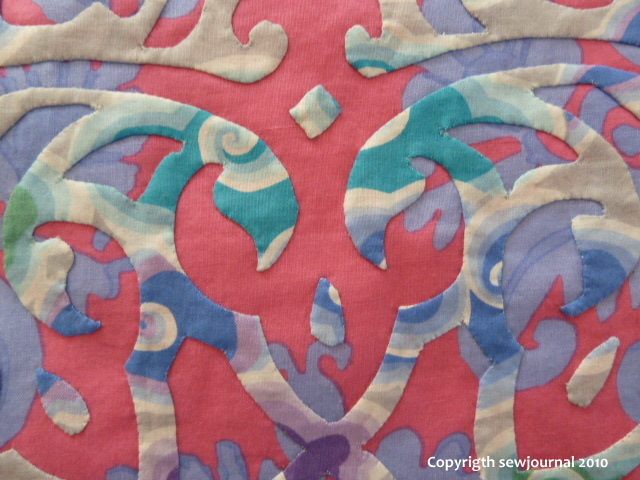 Now I’ve finished the Arabesque appliqué top I’m doing some hand quilting on my Andalusian Tile quilt. I really want to finish this but there is just so much left to do. I already quilted every piece but then decided I needed more quilting and so I jumped in where angels fear to tread and began adding extra quilting to every single shape! This will triple the amount of quilting I need to do. I guess I’m about half way through. 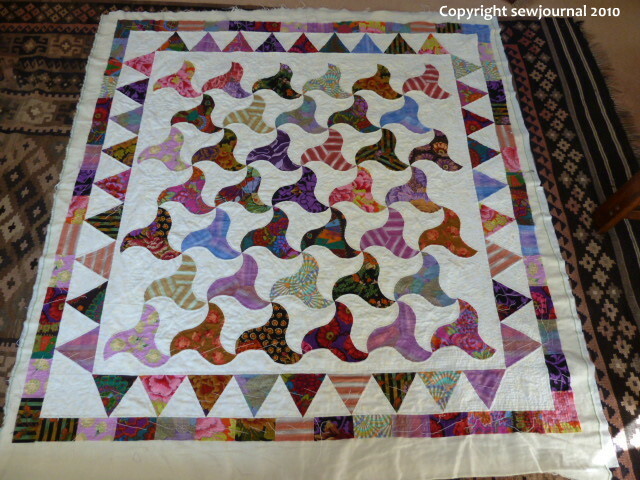 It’s such a lovely quilt and I’m so happy with it that I really want to devote some time to completing it. This is a bit hard when you blog as you can’t show the same project day after day. My plan is to try to do at least a couple of hours of this quilt and then another project each day so that I can do both. I was asked on one of the email lists to show some photos of the details of the piece so here they are. I’ve also tried to take another photo that is better than yesterday’s. The whole piece actually seems to glow in the “flesh” but that just didn’t come out in my last photo. I hope this one does it more justice. thanks for the close-up photos. I can see much better now how busy both fabrics are, but the whole effect is stunning. Thanks Dee. I hope the quilting will enhance it. Your quilt is gorgeous, I love it. The Arabesque is amazing, it really pulls my eye in. I think the Andulusian Tile is especially gorgeous! I like your Andulusian quilt. Don’t worry about more quilting. 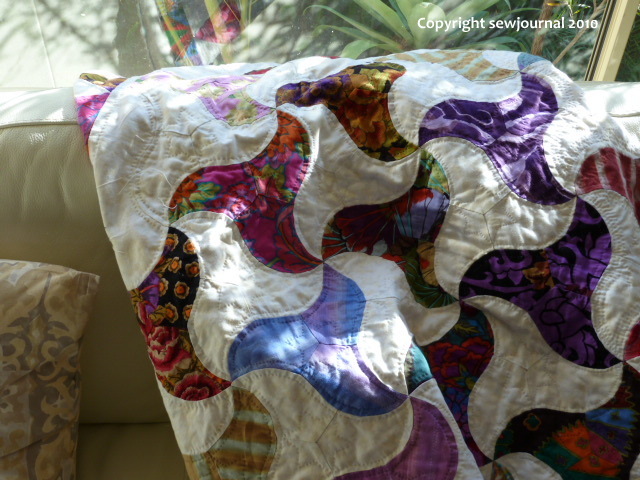 You will never regret doing more quilting, only not enough. It is definitely worth it. Love your Andalusian Tile quilt! Just lovely. 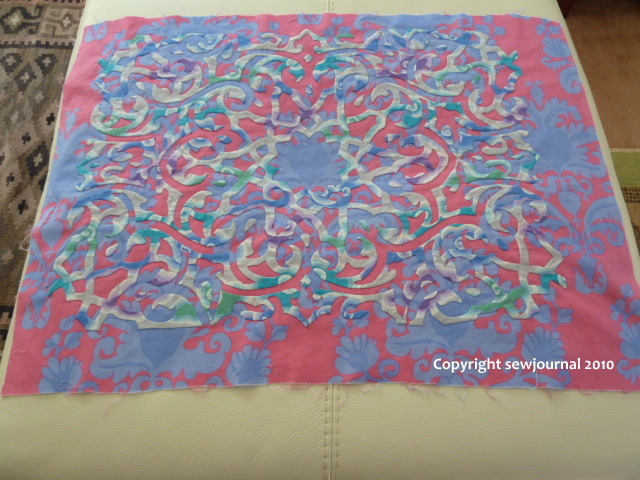 The Arabesque looks wonderfull too & so much work you have put into it.